This is arguably one of the highest priority for modeling right now. Without proper Ayleid furniture assets, we risk repeating Oblivion's mistake in presenting the Ayleid ruins as lifeless, artificial places. Ayleid furniture should follow the basic design concepts of existing pieces like the Ayleid chain, lantern, chandelier, and welkynd holder. Where possible, furniture should have alternate broken or decayed versions. One possible concept is to have many things hanging on chains or suspended from the ceiling: if this is chosen, the existing chain set should be expanded with broken versions, different lengths, and hanging loops similar to the vanilla rope assets. Another idea is to give furniture a very low profile, similar to japanese furniture concepts: kneeling chairs, stuff like that. Infragris wrote: One possible concept is to have many things hanging on chains or suspended from the ceiling: if this is chosen, the existing chain set should be expanded with broken versions, different lengths, and hanging loops similar to the vanilla rope assets. Why did we decide to go with octagonal shapes again? Wouldn't decagonal be more fitting? Ayleids are obsessed with the number eight, apparently. Infragris wrote: Ayleids are obsessed with the number eight, apparently. Not 10? I remember there being something about Ten Ancestors. We already have the chandeliers and the lanterns that are suspended. I wonder, how much space there is for suspended furniture, although it is surely an interesting concept. I think what you could do for the beds would be a framing rack that holds a suspended bedrack inside of it. I'm not sure, if I would actually attach any further welkynds to furniture, except maybe small embedded ones. It seems a bit weird to me to have single welkynds put onto welkynd stands, if they are otherwise attached to furniture or other objects. And overall, the stress on welkynds is a bit heavy, in my opinion. worsas wrote: We already have the chandeliers and the lanterns that are suspended. 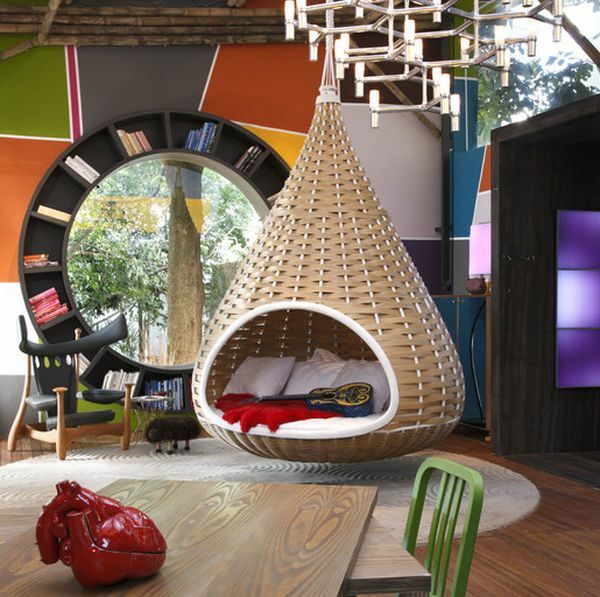 I wonder, how much space there is for suspended furniture, although it is surely an interesting concept. That's why I want to make sure that most, if not all, furniture pieces are are suspended on a singular chain in the center - this way there's less chains cluttering the space and the sihlouettes of these pieces look less industrial and more elegant. I think what you could do for the beds would be a framing rack that holds a suspended bedrack inside of it. Good idea. I was thinking something like a cross of a hammock and a crib. The one in the picture above is not a welkynd, but rather just a crytal-shaped metal counterweight. Yuck. These sound wild-elfy as hell. 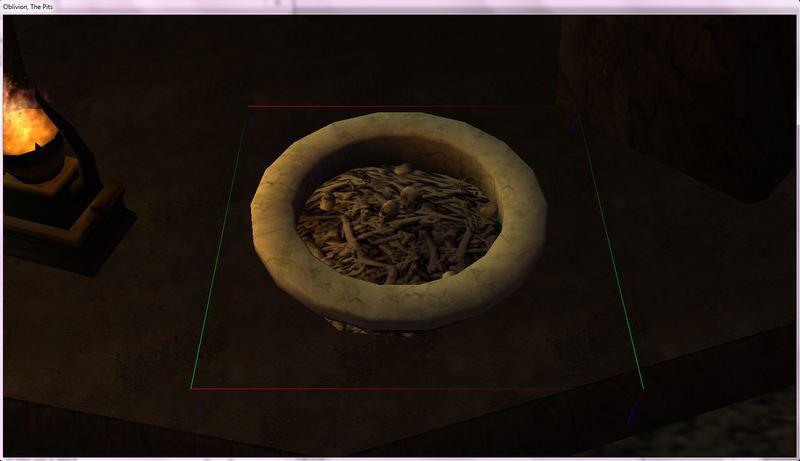 There's a bone pile mesh (ex_sc_bonepile1_3.nif) and texture in The Doors of Oblivion, and RR's Holamayan had ash gardens. We could perhaps reuse those in combination. "Our enemies have undone me, and spread my body into hiding. In mockery of divine purpose, the Ayleids cut me into eighths, for they are obsessed with this number." That's from the Adabal-a. The Ten Ancestors is as far as I know the only place where the Ayleids went decagonal. Their reliquary boxes are hexagonal, even. Presumably, the Ancestors were actual historical figures, so their number is not terribly significant. Where possible, I think most furniture should get ground-based variations to avoid limiting the possibilities for interior modders. In fact, we should perhaps reserve suspension from the roof for a small number of key assets: I don't think it would make practical for every piece of furniture to be bolted in place. It would also start looking a bit silly in heavily cluttered areas. Ah, gotcha! Octagons do indeed make more sense then. The way I see it, it's not really restrictive, just alternative - the fact that the furniture is suspended would let interior modders play with the entirety of 3rd dimension. I thought about the bolted down problem myself, and I think we can alleviate it by adding some unused suspension rings to the ceilings. And the cluttering won't really be bad if we use the minimum amount of chains for each furniture piece. We could go with both, to be honest. Ayleid architecture has so much vertical space available that we could play with the medieval concept of the High Table - the city-state's Sorcerer-King and his/her guests of honor literally sit above everyone at tables and chairs suspended by chains, while the general company kneels on cushions or benches at low tables. Something like these, made in wrought iron, would be a cool concept for the beds - going again with that avian motif, it's kind of reminiscent of a bird's nest. Yeah, that makes sense. My main concern is with making these believable and lived-in spaces: hanging everything from the ceiling is a nice idea in theory, but has the potential of being dissonant vis-a-vis the rest of Ayleid infrastructure. Actually connecting it to Ayleid social customs might help with that. About the beds: how about we go with a more coffin/sarcophagus shape? Hanging from chains or acting as the centerpiece in a room, it would be ambiguous wheter these were some kind of punishment device or if the Ayleid just slept that way. @R-Zero: don't forget SWG's star clouds we discussed on discord. Saint_Jiub wrote: We could go with both, to be honest. Ayleid architecture has so much vertical space available that we could play with the medieval concept of the High Table - the city-state's Sorcerer-King and his/her guests of honor literally sit above everyone at tables and chairs suspended by chains, while the general company kneels on cushions or benches at low tables. Infragris wrote: Yeah, that makes sense. My main concern is with making these believable and lived-in spaces: hanging everything from the ceiling is a nice idea in theory, but has the potential of being dissonant vis-a-vis the rest of Ayleid infrastructure. Actually connecting it to Ayleid social customs might help with that. This a nice idea too. Though I remember there being a talk here about how rich-class Ayleid items survived in unproportional numbers because of quality of their material and craft - so I thought that having more suspended furniture would fit in this too. 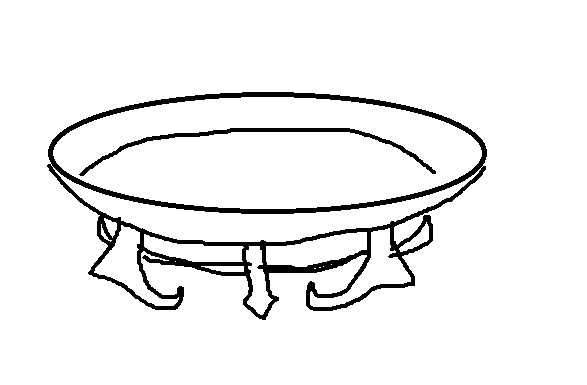 Saint_Jiub wrote: Something like these, made in wrought iron, would be a cool concept for the beds - going again with that avian motif, it's kind of reminiscent of a bird's nest. Infragris wrote: About the beds: how about we go with a more coffin/sarcophagus shape? Hanging from chains or acting as the centerpiece in a room, it would be ambiguous wheter these were some kind of punishment device or if the Ayleid just slept that way. Saint_Jiub wrote: @R-Zero: don't forget SWG's star clouds we discussed on discord. My memory fails me here, sadly - I remember that talk, but hazily. Can you elaborate on this idea here, while we're at it? The idea was to use SWG's Improved Propylon Particles as the base for an ambience enhancer. They could be placed around orreries or other magical instruments - or just about anywhere significant, really. Holographic starfields so that the Ayleids could stargaze even in their underground sanctuaries. They would need to be color-corrected to follow/contrast with the Ayleid aesthetic. I think SWG gave permission to modify the assets, but you could double-check with her if you want to make sure. I found this on my dropbox, pretty sure I retextured this from one of the MJY resource packs, is it something that would be useful for our purposes? I could see it having some high end loot displayed on it, maybe? It would have to be reworked to follow Ayleid sensibilities (and quality standards, I know that resource and it requires a bit of cleaning). I'm not really sure if we want to have figurative statues for the Ayleid? If we do they should have something that sets them apart, I think. Infragris wrote: The idea was to use SWG's Improved Propylon Particles as the base for an ambience enhancer. They could be placed around orreries or other magical instruments - or just about anywhere significant, really. Holographic starfields so that the Ayleids could stargaze even in their underground sanctuaries. They would need to be color-corrected to follow/contrast with the Ayleid aesthetic. Wow, loving that Could you upload that proof of concept model, please? I'm curious how it looks like in-game. Maybe let's script such skybox to rotate at the slowest pace literally, to enhance the impression of oblivious, alluring star-gazing? Some of these stars can be billboard meshes too, so they'd "rotate" with PC, like they are observing the mortal beneath them in response, you know, almost Nietzsche style? berry wrote: Wow, loving that Could you upload that proof of concept model, please? I'm curious how it looks like in-game. Billboard nodes would work just fine, mayme even better depending on how this zbuffered object would interact with other alphaed meshes. This would need to be tested more extensively. It would b impressive if you could pull it off, but it also feels like something that can only be used in very specific, constrained circumstances - it could potentially come across as a texture bug. Infragris wrote: It would b impressive if you could pull it off, but it also feels like something that can only be used in very specific, constrained circumstances - it could potentially come across as a texture bug. Yeah I guess it would be best if we had a sort of circular domed room, like sort of a planetarium, for this. Partially inspired by cages used for gibbeting. Consists of 2 parts - the cage itself and a door that slides aside rotating on a central axis pivot points. The door could be a separate object - "Door" for the cases we would want them to be openable by Player (dat immersion!) or a "Static" for those stuck in their position after so many years. The cages were originally lined up with soft betting material (silk or bird down or whateved Ayleids did use) but nowadays only ancient unidentifiable fragmental rags remain. The rotating door could be lined with cracked glass. The Ayleid nobility would sleep in these in vertical position, fixing themselves with belts or straps or, in case of the most prominent sorcerers, long-lasting Levitation magic. We could even feature Ayleid skeletons still stuck in some of these. Looks great. Could you do a version with spikes and stuff on the inside? For reasons. Infragris wrote: Looks great. Could you do a version with spikes and stuff on the inside? For reasons. If they are intended as sleeping cabins, we should avoid making them look like torture cages. The spikeless variant will just like a lesser version of it in the end and the whole concept of a spiked cage seems too coarse and simple for Ayleids, imo. Finally planned out the basic shape of Ayleid hanging chair after what felt like countless iterations: https://dl.dropboxusercontent.com/u/100 ... ychair.jpg I guess I just had to actually look at existing Ayleid meshes instead of getting fixated on octagons. To be honest, I'm not sure this design works - because the chain is offset to the left, the chair would hang at an angle. It either needs to have a second chain supporting the other side, or else the chain needs to hang in the middle. I'm fine with that proposed chair design. I slowly start to see this concept of suspended furniture working. First actual versions of suspended ayleid furniture (a table and a chair), plus chain segments of different lengths to allow variation in vertical position. https://www.dropbox.com/s/24ithttl28qis ... y.jpg?dl=1 So far, as you can see, furniture pieces use a single chan in the center, which helps to keep cluttering to a minimum. Versions with slow rotation, as if because of wind, will follow. This, coupled with subtle chain rattle sound emitters, would make for a great atmosphere, I think. In all honesty, I'd prefer if we shied away from conventional furniture designs - our Ayleid tileset looks very stereotypically "elven" now, with all the arches, tall ceilings and white stone - not a lot of things convey the "this is where ancient sadistic birdaboo slaver elves lived!". Perhaps unusual movables would help to better characterize the Wild Elves and make them seem more like an outlandish, alien culture of old. I must say as I wrote on Discord. I don't care much for the idea of single legged tall furniture pieces. Just having four or three legs is fine by me, I don't think there's any other elegant solutions. The design of the legs can be weirded up, bird legs, curious shapes, whatever. Just as long as there's a coherence to the set. In general I think having the suspended furniture as an asset to use in some rooms is fine, but it's also very limiting for interior modders. There can also be a lot of combinations between floor versions and suspended versions, like I'd like to use the suspended table with floor version chairs a lot, I think it'd look awesome combined. If we only had suspended furniture, I think these interiors would end up funny looking and horrible to explore for the player, having to rely on levitation constantly (which doesn't work very well indoors). Occasional suspended furniture is fine to break the 'mundane', or to continue the avian theme from the feathers and birdlike appearances, but it shouldn't end up as the furniture used in every room. Like infragris put it, it would end up looking a bit silly in well cluttered rooms. It also won't work perfectly with the very squarish, symmetrical layout of the Ayleid ruin set in general. If we were to have these vertical, weird, suspended furniture rooms everywhere, the ruins should have been much more organic, circular and irregular in shape. Would be easy to make in suspended as well as floor versions. 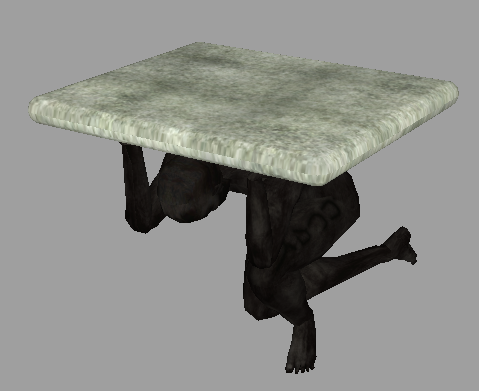 In general, just think of furniture with completely alien functions related to Ayleid culture. The furniture in Infragris' inital list is also needed of course, and should be finished first - in suspended (when making sense) and floor versions.